Blairite Chuka Umunna was one of numerous right-wing Labour MPs who attacked the result and demanded 'an internal inquiry into the party's campaign.' Of course, any genuine inquiry would lay blame at Umunna and friends' role in the run up to 3 May, with their relentless attempts to falsely claim antisemitism is rife in Corbyn's Labour. This is now being escalated further. The leader of Barnet Labour Group has laid the blame for failing to win his council firmly at Corbyn's feet, saying voters rightly "felt the Labour Party has failed to deal with antisemitism at a national level". Unfortunately, there is no doubt that - in a borough where around 15% of the electorate is Jewish - the false charges of antisemitism had an effect, especially given the failure of the Labour left to vigorously rebut them, instead endlessly retreating in the face of them. The most important lesson of these elections is that the retreats in the face of the Blairites must stop. The capitalist wing of the Labour Party remains determined to defeat Corbyn and will use all means to do so. The task of removing them - as part of the process of transforming Labour into a democratic, mass working class socialist party - is overdue and now posed extremely urgently. 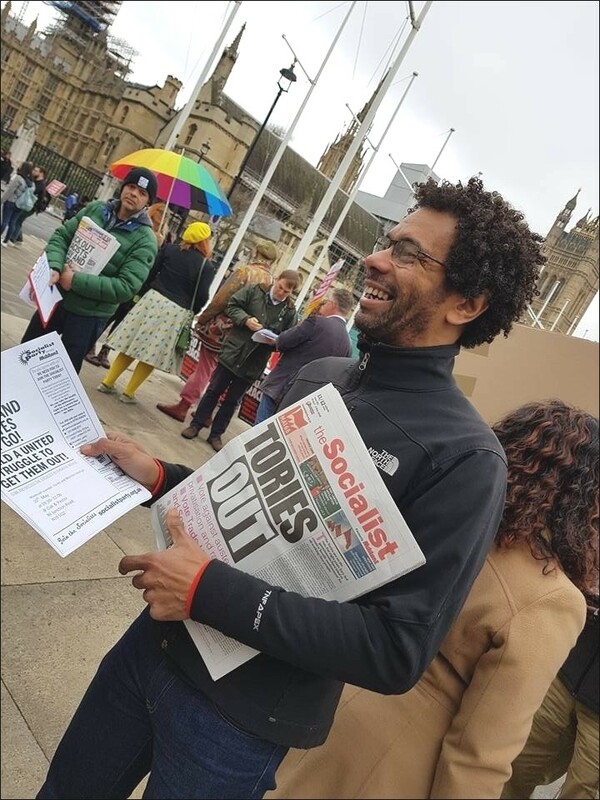 If, instead, the concessions to the Blairites continue, there is a real danger that disillusionment will set in among many who were inspired by the radical programme of the last general election as they sense, rightly, that a party that cannot stand up to the capitalists in its own ranks would be unlikely when in power to stand up to the capitalist class in order to fight for a programme for the many not the few. Nonetheless, these mixed local election results do not preclude a new wave of enthusiasm for Corbyn in the next general election. However, they do indicate warning signs. One hundred and fifty councils had elections, covering many major cities and towns in England. Labour made some gains, largely based on a continuation of the swing to Labour in London, albeit on a smaller scale than predicted beforehand. However, Labour's net gain was only 77 councillors nationally, with no change in the number of councils it controlled. The Tories succeeded in unseating a handful of Labour-led councils in working class areas - such as Derby, Nuneaton and Bedworth, and Basildon. According to the BBC's national share of the vote projections, if the local election results were to be repeated in a general election, they would put Labour and the Tories neck and neck on 35% each. There are not yet national figures on turnout for this year's local elections, but a small minority of wards had a turnout of over 40%, with 30% or less common in working class areas. Without doubt a majority of both young and working class people did not vote in Thursday's elections. For Corbyn to have convinced bigger sections of them to have voted it would have had to be linked to an active, mass campaign to force May to call a general election to get the Tories out. 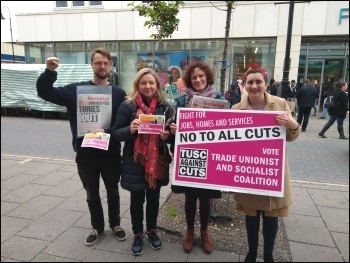 The TUC trade union demonstration taking place on 12 May has the potential to be a step in that direction, if it is built for as a mass 'Tories Out' demo, although unfortunately it appears to be being built for in an entirely routine way by the right-wing leadership of the TUC. 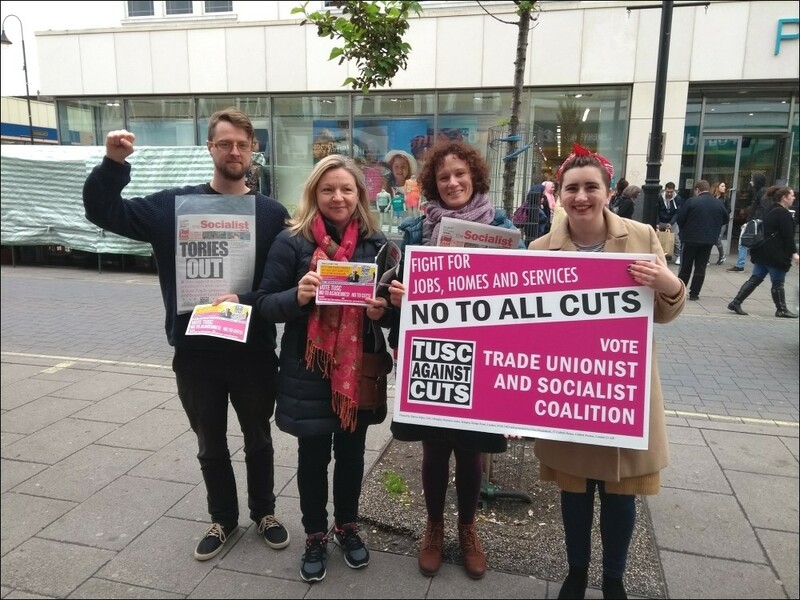 Even Polly Toynbee, a supporter of the Labour right, bemoaned what it currently means to be a Labour councillor, and do "the dirty work of austerity", and declared: "The wonder is that anyone stands as a councillor at all when political choice has been so drained by the savagery of the cuts." In fact Labour councils do have a choice. If they were to stand up to this weak, divided government and refuse to implement cuts there is no doubt that they could defeat it. Given their experience of austerity being introduced by councils of every political stripe it is no wonder that many did not bother to vote. One of the few areas with a significant increase in voter turnout was Haringey, where it increased from 33 to 39%, reflecting the desire of residents to protest against the previous Blairite council's HDV gentrification scheme. Many of those who did vote in the local elections did so to protest against the misery that has been inflicted on them at local level. The capitalist media has drawn a direct link between Labour losing places like Basildon, Nuneaton and Derby and the question of Brexit. But while it is true that these are all areas where a majority voted for Brexit, and also where some who had previously voted Ukip switched to the Tories, it is too superficial to suggest that Brexit was the only, or even the main, issue which motivated voters. While on the surface it could appear that we have returned to the post-war era of two party politics, with entrenched loyalties to both the Tories and Labour, this is not the case. Support for Jeremy Corbyn does not equal automatic loyalty to Labour but rather a searching for an alternative to austerity. 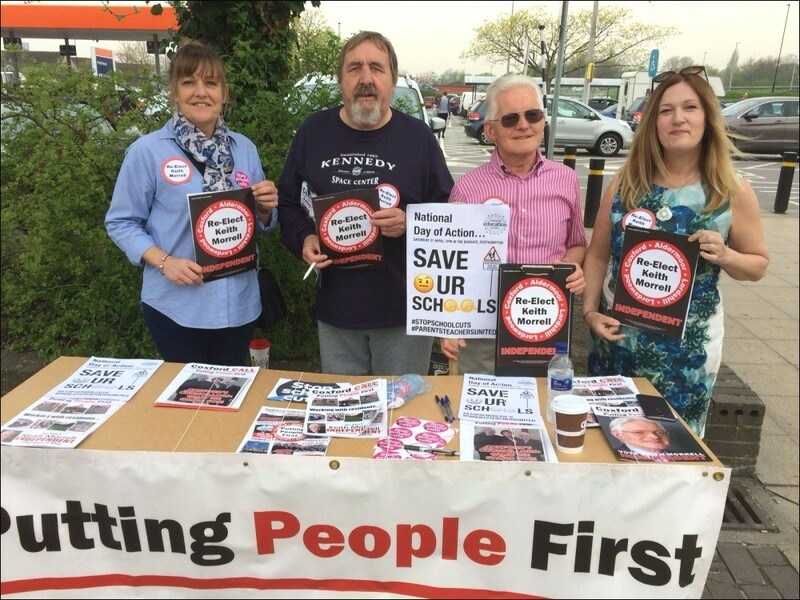 In Southampton, Socialist Party member and anti-cuts councillor Keith Morrell was re-elected on a landslide, with 1,595 votes (46.9%). His nearest rival, the Labour candidate, received 958 votes. There were other very good results, notably Mike Forster, standing in Crosland Moor & Netherton, in Kirklees, got a very creditable 701 votes (14.2%). On average the TUSC vote was slightly higher than last time it stood (see TUSC results report for the full picture). Brexit did, of course, play a certain role in the elections, and continues to loom over the Tory Party in their aftermath. The Liberal Democrats were reduced to a tiny rump the last time these seats were contested, in 2014, losing 310 seats and hated for their role in the Con-Dem coalition. Their resurge this time (of 75 seats) is therefore still very limited. However, it is clear that the success they had was mainly in middle class Remain-supporting areas, where a section of Tory voters switched to the Liberals. 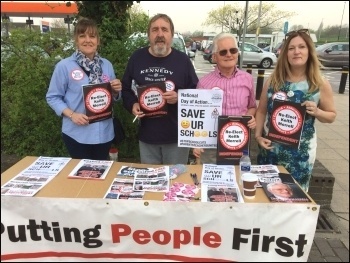 Something similar was also an element of the increase in the Green vote, although it was clearly secondary in areas like Sheffield and Waltham Forest for voters wanting to express their anger at the actions of the Labour councils. In that situation the Blairites, acting on behalf of the capitalist class, will do their best to sabotage a Corbyn victory and, if they fail at that, to assist the ruling elite in trying to prevent a Corbyn government implementing any significant pro-working class policies. In the post-election period they are already further ramping up their campaign, not least by demanding Corbyn puts a neo-liberal, pro-capitalist single market position on Brexit. This version of this article was first posted on the Socialist Party website on 6 May 2018 and may vary slightly from the version subsequently printed in The Socialist.